Our consultants pride themselves on being able to work on multiple systems, with multiple data sets, and providing a simple solution for end users and management to view data and make decisions. We can work with systems in a state of change, systems that have lived out their useful lives, and new systems being added to the ecosystem. Whether you just purchased a new company and are allowing them to stay on their current system or want to migrate them over to your system, we can help. 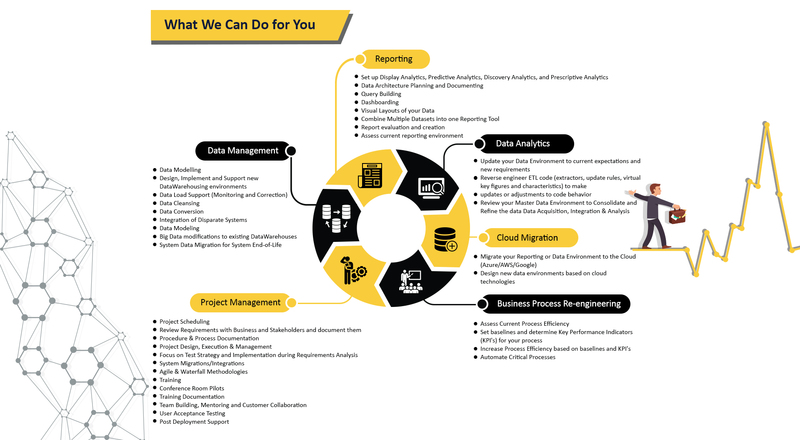 We can also migrate them over to your current system, migrate their data into a separate area of your reporting solution and end-of-life that old system. Master Data Management can be a chore for growing companies that are acquiring new companies. We can help consolidate your Master Data environment so that it is consistent for all of your companies. We can set up an ecosystem that will display beautiful charts and graphs and make data meaningful to you. With Analytics comes insights. Get to know and understand your business through your data. Data on the Cloud is accessible to whoever you like whenever you like and on whatever device you plan to use. Sometimes you are not capturing the correct data in your process or your analytics have told you that process changes need to be updated. Projects need to be managed to keep folks working in the same direction and moving forward.